There are plenty of alternative uses for okra, due to its wide range of health benefits, but most of the okra health benefits are due to the minerals, vitamins, and organic compounds found in this vegetable. The okra health benefits include its ability to lower cholesterol levels, improve digestion, improve vision, improve skin health and even prevent certain types of cancer. Okra (Abelmoschus esculentus) is one of the oldest vegetables cultivated 3,000 years ago in Ethiopia, on the banks of the Nile. Till the present day the largest producers in the world are India, Pakistan and Nigeria. Okra is widely used in Asian, Arab and African cuisine. It is called by different names – “quiabo” in Brazil, “kingombo” in Cuba, “okra” in Germany, “ladyfinger” in South Asia, in parts of the United States and in the other English-speaking areas it is also known as “gumbo”. In Turkey coffee is brewed from roasted seeds of okra and in the USA a spicy Creole stew “Gumbo” is made from it. The tree grows up to 2.5 meters in height and the pods grow from 10 to 20 cm with white seeds in it. Okra is rich with Vitamins A, C and group B vitamins; from the minerals it is rich in calcium, iron, magnesium, phosphorus, potassium and pectin. Nutritional value per 100 g okra: 31 calories, 1g fat, 3g protein, 3g carbohydrates. 1. Low on calories, it is containing just 31 calories in 100 grams, which makes it perfect for any weight lost program. 2. It is not containing cholesterol or any saturated fats. 3. It is helping in stabilization of a high blood sugar levels, by slowing the absorption from intestines. 4. It contains many dietary fats and it is acting as natural laxative, which helps the removing of constipation on a natural way. Also, the okra’s fiber is feeding the beneficial bacteria in the gut (probiotics), which are helping in the pH balance maintaining in the digestive tract. 5. Very rich in vitamin A and many other antioxidants. Its green pods are containing lutein, xanthine and beta-carotene, which are preserving a good vision and keeping the skin healthy and fresh. 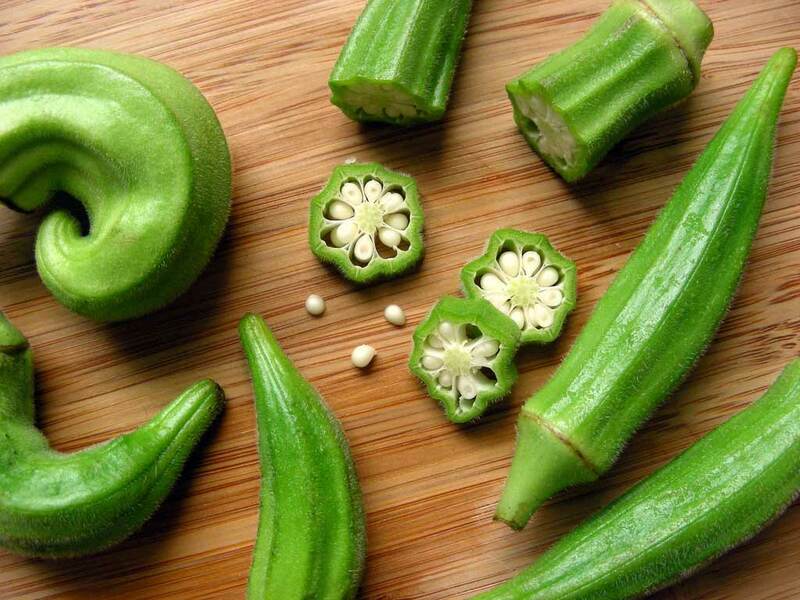 Okra is connected to the cataract prevention, and it is praising for the prevention of pimples and spots. 6. During the profusion of fiber and antioxidants, okra is often connected with the prevention of cancer, and most of all, with the prevention of a colorectal cancer. 7. It is amazing source of Vitamin C that is helping the immunity of the body. Okra is especially recommended for fast healing the cold and its prevention, too. Because of its anti-inflammatory properties, it is also good in reducing the sings of asthma. 8. Okra contains folates, 100 gr okra is providing around 22% recommended daily folates amount. The folates or folic acids, are essential in pre-conception time, and due an early gestation. They also, prevent the birth defects. 9. It is a rich source of many important minerals, such as calcium, iron, manganese and magnesium. 10. Okra is containing Vitamin K that is very significant for the health of the bones and is playing a great role in healing blood clotting. Besides raw, okra is available as frozen, canned and pickled. It can be consumed in soup, steamed with other vegetables, fried or roasted. During the cooking okra releases mucus which thickens the dish, if you do not like dense food, before cooking soak the okra for about 2 hours in cold lemon juice or in mixture of vinegar and water.